On my 21st birthday, S took me to a great little restaurant in Chicago called Tandoor Char House. It is a Pakistani restaurant that has some pretty unique items in the "fusion" section of their menu. 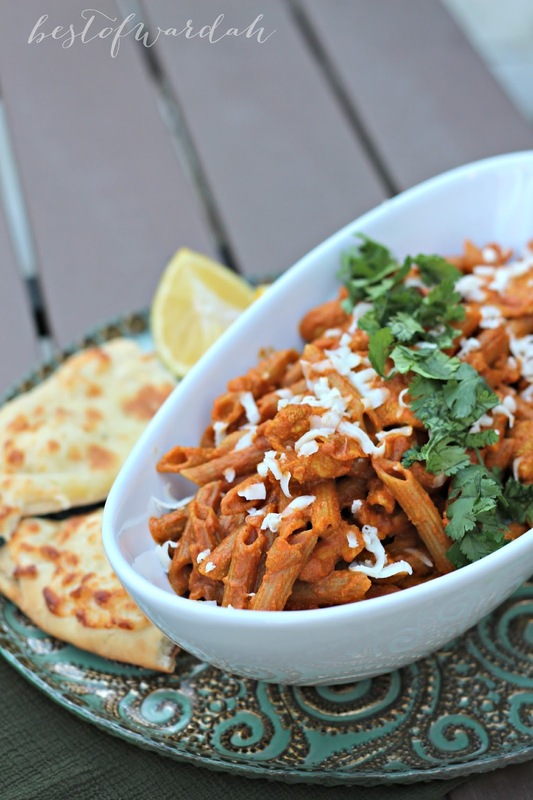 "Penne tikka masala" immediately jumped out to me from the menu. I had to order it and we both fell in love at first bite. I knew I had to recreate this recipe when S started asking for it at least once a week. 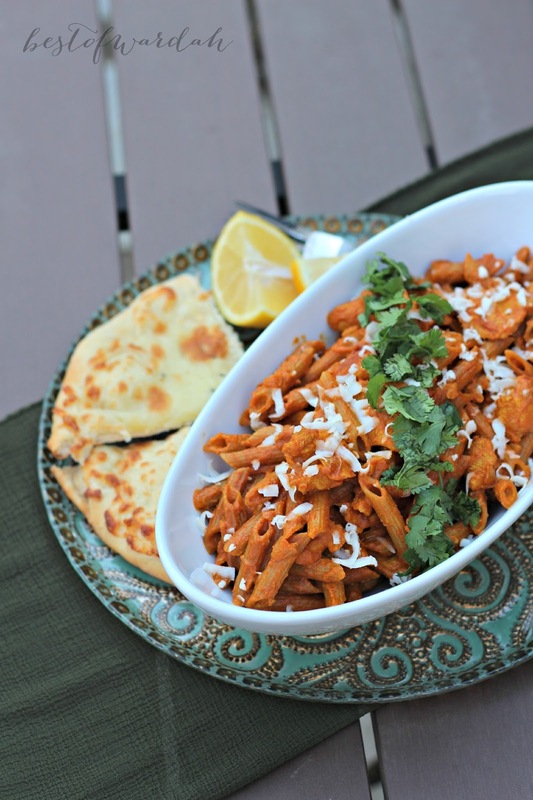 So here's my take on this clever fusion dish - penne chicken tikka masala. I hope you give it a try and please share if you do! I'd love to hear from you. Combine the marinade ingredients together until fully combined. Stir in the chicken until fully coated. Keep covered in the fridge for 4 hours or upto overnight. Remove from fridge 30 minutes before cooking to allow it to reach room temperature. Melt 1 tablespoon of butter with 1 tablespoon of oil in a grill pan or nonstick pan. Fry the chicken pieces in it for 5-7 minutes on medium-high heat or until fully cooked. Set aside. Boil the pasta according to box directions. You want to leave it al-dente. Melt rest of butter and oil in a large pot (I used the same one I boiled the pasta in). Add the chopped onion and sauté for 5 minutes or until it starts to turn golden brown. Add in the garlic and ginger paste and cook for 1 minute or until aromatic. Add in salt, chili powder, and cinnamon and cook for 1-2 minutes while stirring constantly. Add the tomato sauce and cook at a high heat for 5 minutes, constantly stirring, until the oil starts to show through. Add sugar and heavy cream and cook on a low heat, a low simmer, for 2-3 minutes. Add hot water to the pan to thin the sauce to the consistency you like. I added around 3/4 cups of water. Add the chicken and all its juices to the pan. Cook for a few additional minutes until you are sure the chicken is fully cooked through. Add pasta back to the pan and stir until fully combined. Turn the heat to low and cover and cook for 10-15 minutes so the flavor can infuse into the pasta. 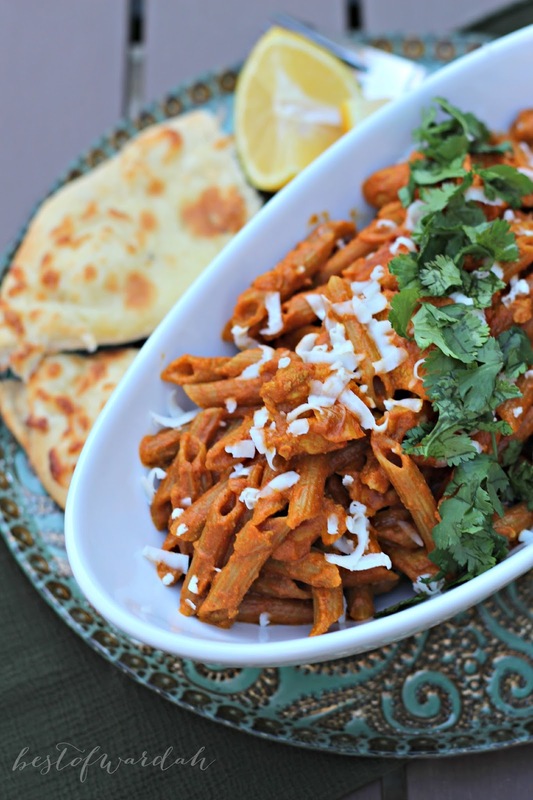 Serve with cilantro and freshly grated paneer on top. 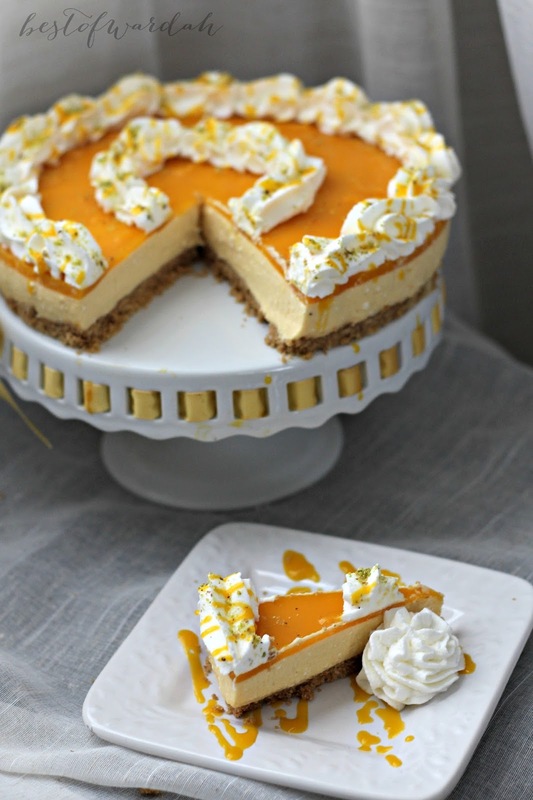 You may also be interested in this dessert I posted a few weeks back - mango cheesecake. This was what we ordered for dessert from this restaurant. Delicious! duuuuuuuude this looks so good! Totally making it soon iA. thanks for the awesome recipe!